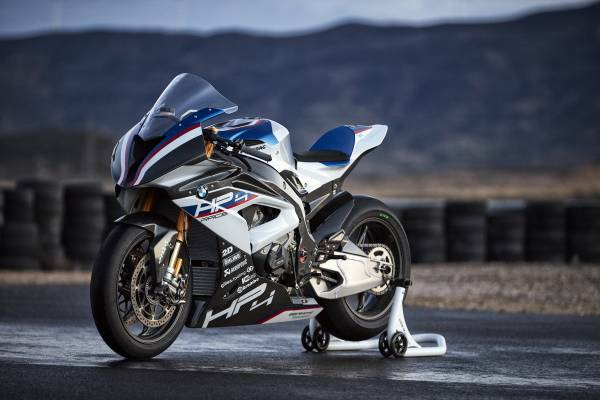 When the HP4 Race concept was announced in the fall of 2016, I was very skeptical about the BMW’s carbon fiber frame project and it almost sounded far-fetched. This was mostly due to the fact that other manufacturers had tried to build motorcycles with carbon-fiber frames, and ultimately failed to create a machine that was user-friendly. The history of motorcycles with carbon-fiber frames goes back to the late 1980s when Cagiva Mito built a two-stroke 500cc Grand Prix racebike with a carbon-fiber frame. A more recent example of a carbon-frame motorcycle experiment would be the famous abandonment of the composite material by the Factory Ducati MotoGP team during Valentino Rossi’s tenure on the Desmosedici. But while it didn’t consistently work for Ducati in MotoGP, the brand has stuck with carbon-fiber for the super-high-end, limited-production Superleggera, which seems to be doing pretty well. 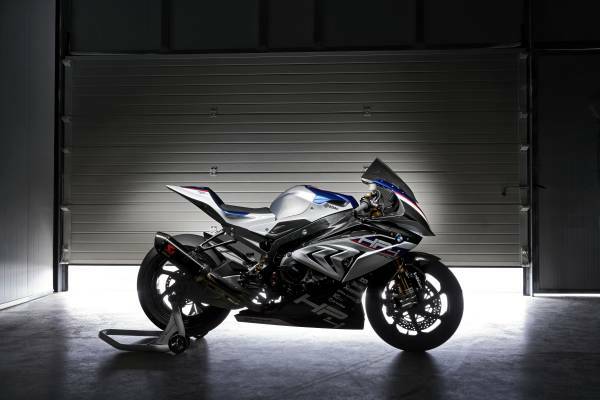 And obviously, the struggles other brands have had in the past with composite frames have not deterred BMW from building a sportbike based on the S1000RR, with a carbon-fiber main frame. Most certainly some will say there is no company better equipped to tackle a carbon-fiber main-frame project for a production motorcycle and do it right. However, BMW was the first to industrialize the use of structural carbon-fiber component in mass-produced cars such as the M3, i8, and electric i3, so company engineers have experience with the composite material. BMW initially introduced the high-performance HP4 production model in 2013, then incorporated the HP4’s upgrade into the S1000RR model update in 2015. 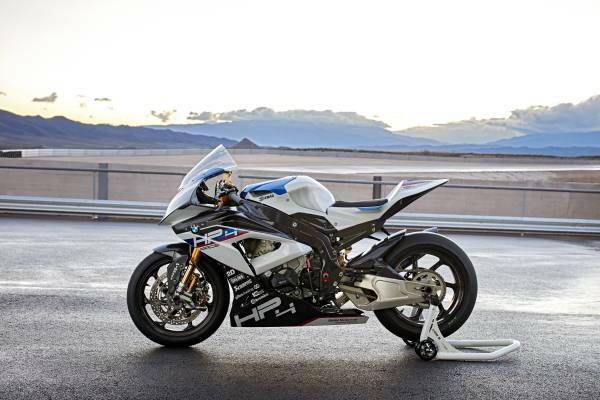 BMW product planners and managers knew they needed to do something spectacular to create the next generation HP4, and they decided to go big, with a carbon-fiber main frame, and a race-spec engine. 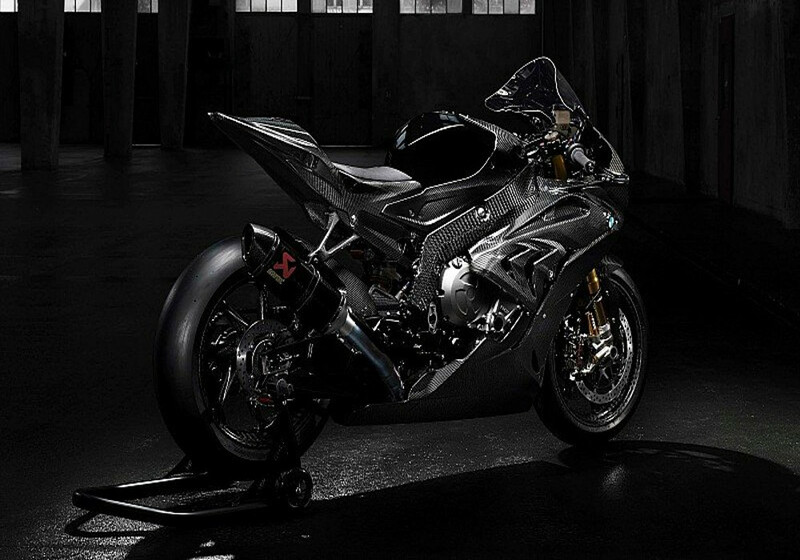 Elmar Jager, who works in the pre-development department at BMW Motorcycles, brought up the concept of a carbon fiber framed S1000RR. From there it was left up to Josef Maechler, who is in charge of Product Sales Strategy and Product Management for BMW Motorcycles, and Rudolph “Double RR Rudi” Schneider, Head of 4- and 6-cylinder Product Projects, to figure out if it was possible. They did and they named it the HP4 Race. A 37-year-engineer with racing department experience Christian Gonschor, became the HP4 Race Project Leader. His mission was to bring lightweight material technology in motorcycles to the next level with a carbon-fiber main frame that retained the feel needed for a rider to push the limits of the bike. And his assignment brief included doing it in only two years. Piece of cake, right? Adding to the overall performance would be Öhlins FGR 300 Superbike forks, an Öhlins TTX 36 shock, a Suter swingarm, and World Superbike electronics. The result is a motorcycle that puts out a claimed 215 bhp at the crankshaft with an overall wet weight (including a full tank of fuel) of 377 pounds (171 Kg). Development focused on retaining the balance between frame rigidity and feel. To achieve this BMW engineers used Resin Transfer Molding (RTM). It’s a process in which a blend of non-woven carbon-fiber fabric with continuous fibers is placed in a large vacuum mold, (along with frame hardware), and a precise amount of resin is injected into the mold. The use of RTM gave BMW engineers the ability to mass-produce one-piece carbon-fiber frames without any inconsistencies in the performance from one unit to the other. The end results is a main frame with similar feel and flex characteristics when compared to the S1000RR’s aluminum frame. 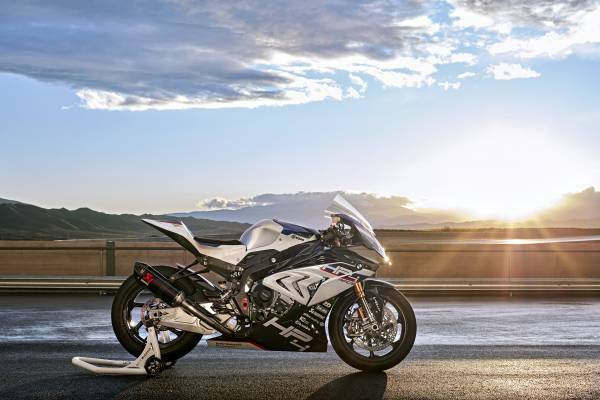 Make no mistake: It may be too light for the Superbike World Championship, but the HP4 Race is a production racebike legal for use on public-road courses. . It comes with all the adjustment a Superbike team could need to customize the motorcycle to the rider’s needs. As delivered, the HP4 race has 30 mm of offset and the rake set at 23.5 degrees, which places the trail at 102.5 mm. BMW offers offset inserts that range from 26mm to 32mm, in 2mm increments. Rake can be adjusted in .5 or 1-degree increments on either side of the zero setting of 23.5 degrees. More adjustment is available at the rear of the HP4 with the option of moving the swingarm pivot up or down 4 mm, in 1 mm increments. That is a lot of adjustment. Additional weight saving was achieved on the HP4 Race by fitting carbon-fiber wheels built using a process known as braiding, where one piece of fabric is wrapped in place by a machine. A dense foam is also inserted into the wheel spokes to reduce vibration. The end result is a set of wheels that are 30% lighter than aluminum racing wheels, reducing the gyroscopic effect of the rotating wheel, which theoretically improves the turning and transitioning of the bike. BMW engineers were careful to retain the same rigidity as existing aluminum wheels in order to not reduce feel or create chatter or grip problems at full lean. More World Championship level components were used for the brake system, with Brembo GP4 PR brake calipers that are actuated by a billet aluminum Brembo RSC 19×18 master cylinder. The brake calipers clamp onto a set of 6.75 mm thick, 320 mm Brembo T-drive discs rotors. The bottom-mounted Brembo rear brake caliper features four pistons and works with a 4mm—thick 220 mm rear disc. The rear subframe and seat assembly are made out a woven carbon fiber using a conventional lay-up technique. Using carbon fiber allowed BMW to easily build in seat adjustments in 15 mm increments. The HP4 Race is delivered with seat position at 32.7 inches (831 mm) and there is an option to lower the seat to 32.1 inches (816 mm) or raise the seat to 33.3 inches (846 mm), depending on the rider’s preference. 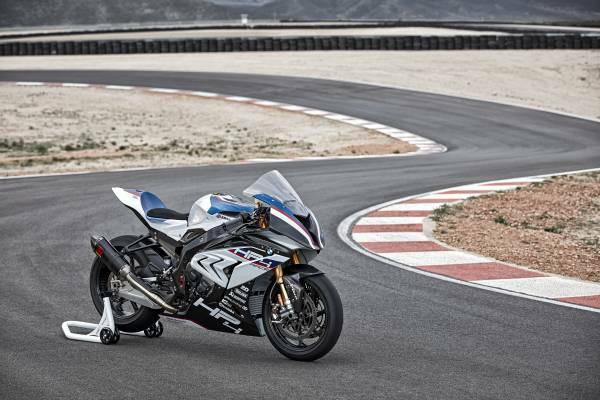 At the center of the HP4 Race is a race-tuned version of the S1000RR’s DOHC four-cylinder engine with an 80 mm bore and 49.7 mm stroke, displacing 999cc. 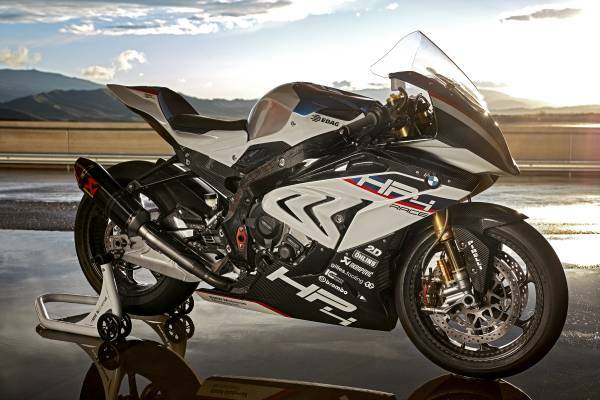 The HP4 engine uses a combination of what BMW calls the 6.2 and 7.2 engine specs, and puts out a claimed 215 bhp at 13,900 rpm, at the crankshaft—or about 16 more horsepower than the S1000RR streetbike engine. The HP4 Race engine also makes 5.1 lbs.-ft. more torque than the S1000RR, putting out a claimed 88.5 lbs.-ft. at 10,000 rpm. While BMW engineers were tight-lipped about the valve timing and lift numbers, I can tell you that the 6.2 valve train is used in the Endurance World Championship and is designed to increase performance by allowing the redline to be to 14,500 rpm, while maintaining reliability as the miles pile up. Information on the compression ratio is also somewhat vague, with BMW claiming the ratio is between 13.7:1 and 13.9:1. To broaden the power curve, BMW uses its own version of electronically controlled variable-length intake funnels (a.k.a. velocity stacks) with the transition from long (for acceleration) to short (for top end) taking place at 11,500 rpm. The Akrapovic 4-2-1 titanium racing exhaust system comes with a carbon fiber muffler. Each engine is expected to last 5,000 km (3,100 miles) before needing to be replaced. If you take into account that the average track-day rider or club racer rides between 100-300 miles per weekend and does about five weekends per year, you are looking at an engine life of three to five years before needing a replacement. Gear ratios for first and second are taller for racetrack use when compared to the standard S1000RR parts. Third gear remains the same, while fourth through sixth gears are shorter. The primary gear ratio was unchanged; see the spec chart for ratios. Like most racebikes, the HP4 Race is set up for GP shift pattern (up for up) when delivered, and comes with the auto-blip function enabled for clutch-less up-shifts and down-shifts. A motorcycle with cutting edge chassis design and a powerful engine needs an electronic suite to match. The HP4 Race comes standard with an electronic package similar to what the brand uses in the Superbike World Championship. As delivered, the system comes with four riding modes: Wet, Intermediate, Dry1 and Dry2. Each mode has different throttle maps that control wheel torque (a.k.a. power delivery) by limiting the throttle butterfly valve opening. In Rain mode, throttle opening is limited to 67% in first gear, 71% in second gear, 75% in third gear, and 95% in fourth gear while fifth and sixth allow full throttle. The throttle map in Intermediate Mode is opened up slightly with 71% opening available in first gear, 79% in second gear, and 88% in third gear, while fourth through sixth allow 100% throttle opening. Dry1 mode allows 75% opening in first, 83% opening in second, and 93% opening in third with full throttle available in fourth through sixth. The Wheelie Control function is also active in all gears in Rain, intermediate, and Dry1 mode. Dry 2 mode’s map throttle progression is even more aggressive; first gear is limited to 75% throttle opening, but then the map jumps to 92% throttle opening in second, and 96% throttle opening in third. Full power is available in fourth, fifth, and sixth gear. BMW’s carbon-fiber experiment actually performs the way a bike should. It has the right balance of rigidity and feel needed to push the chassis, and components from Öhlins and Brembo worked as expected from industry-leading manufacturers. 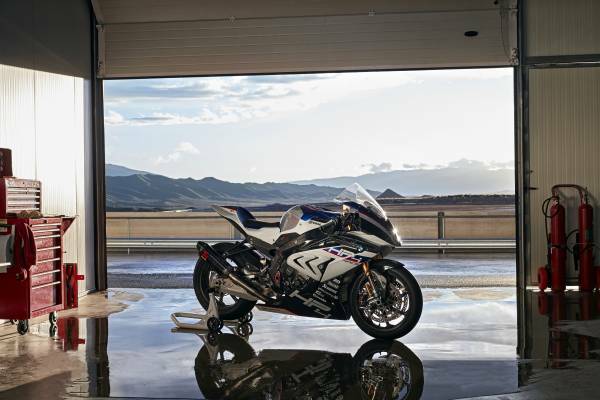 Adding World Superbike-level electronics and a high-spec engine make the BMW HP4 Race an extremely potent racetrack machine. The BMW engineers did it their way—and did it perfectly well.